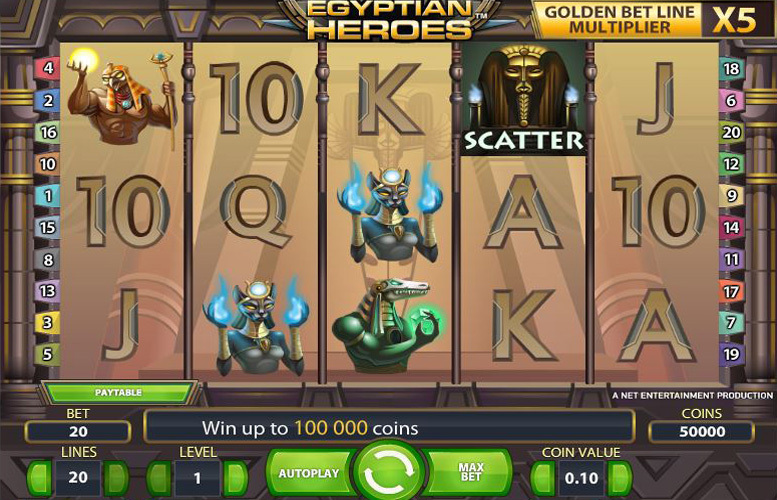 Ancient Egypt is the theme for Egyptian Heroes; a five reel and three row slot game providing players a choice of between one and 20 paylines and having a theoretical return to player percentage of between 93.8% and 96.7%. As well as that control over paylines, the game also boasts special features like expanding wilds, a free spin scatter symbol and a ‘Golden Bet Line’ to introduce some added excitement to the equation. A slot that will appeal to any player with an affinity for the mysteries of the Pharaohs and the pyramids, Egyptian Heroes has plenty to offer all other slots fans too. Below you will find a brief guide to the game’s highest jackpot, its special symbols and features, the Egypt themed paytable and the control it offers players over betting amounts. 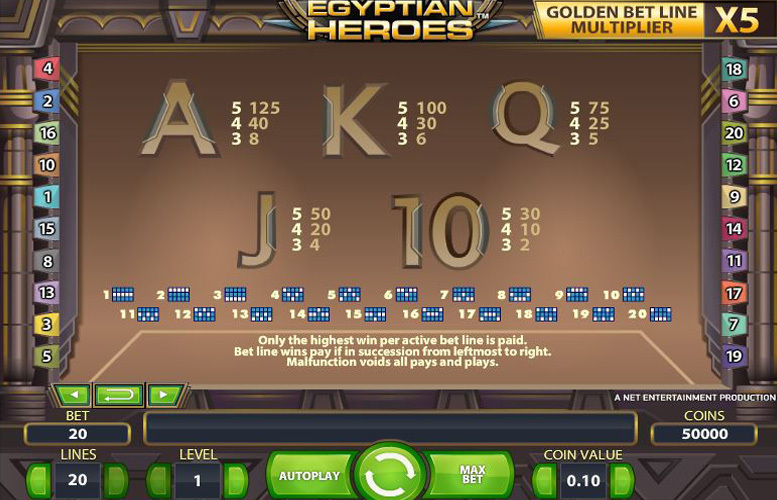 Egyptian Heroes allows players to choose to play between one and 20 separate paylines for each spin. However many lines are active though, the most valuable winning combinations are always those featuring five identical symbols consecutively from left to right across an active line. The most valuable symbol in the game is the sun god symbol, and five of these symbols across a payline pay out at a rate of 4000 times the bet level for the spin. At the highest bet level of 10 therefore, the payout can equal 40,000 coins which at the highest possible coin value of 50p would be worth a total of £20,000… however couple this with the games 5x multiplier symbol and you have a top payout of £100,000. 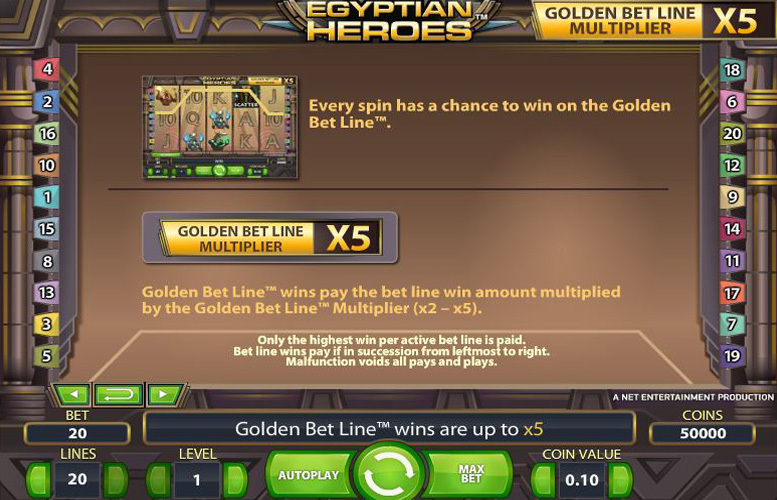 Within the gameplay of the Egyptian Heroes slot, there are a total of two special symbols and one additional ‘Golden Bet Line’ feature. The special symbols are an Expanding Wild symbol and a Scatter symbol which serves to activate free spins. Wild – the Expanding Wild symbols can appear anywhere on reels 2-4, substitute for all other symbols apart from Scatter symbols and if they make up a winning payline they expand to cover the whole of their reel. In all cases, the wilds are applied to create the most valuable possible combination across any winning payline. Scatter – Scatter symbols can appear at any space on any reel and if three or more of these appear anywhere, it triggers a certain number of free spins. Three Scatters activates 10 free spins, four activates 15 and five activates the maximum of 20. Free spins occur at the same bet level and coin value of the spin which activated them and also have the same active paylines. During free spins, a Sticky Expanded Wild covers the middle reel and together with the still active possibility of Expanded Wilds on reels 2 and 4, this can produce really big payouts. Scatter Symbols can still appear anywhere during free spins and activate additional free spins in the same way as during the main game. Golden Bet Feature – The ‘Golden Bet Line’ feature randomly applies a multiplier of between x2 and x5 to one payline per spin to potentially increase any winnings significantly, but can be applied to an inactive payline. All of the Egyptian Heroes symbols are themed around Ancient Egypt and the most valuable of them are those which depict Egyptian gods. Most valuable of all is the symbol of the sun god who holds a staff and a glowing orb. If five of these line up along an active payline, the player wins an amount equal to 4000 times the current bet level. At the highest bet level of 10 then, that payout would equal a total of 40,000 coins which can be worth up to £20,000. The second most valuable symbol pays out at a level of exactly half that (2000 times the bet level) and depicts a blue cat god. 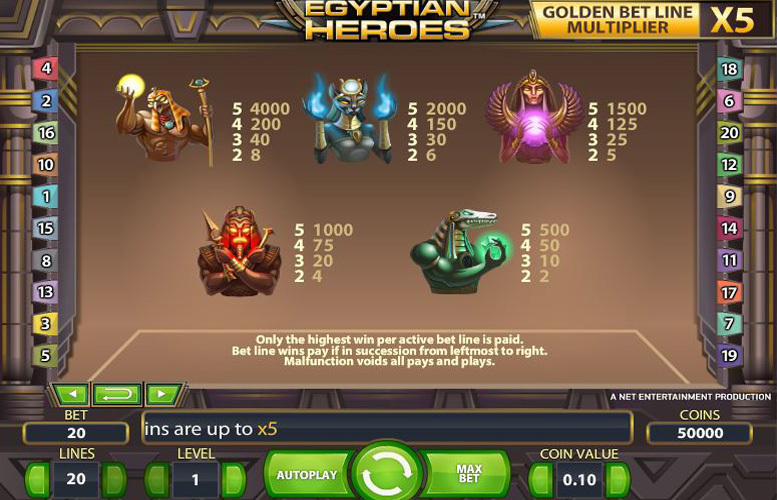 One of the more notable features of the Egyptian Heroes slot game is the level of control which it provides to players over their betting amount per spin. Players are afforded the opportunity to play anywhere between one and 20 paylines and can also set their bet level per line and the coin value. There are ten bet levels from 1-10, with each adding an extra coin per line, and six coin values from 1p to 50p. The upshot of all of that therefore, is that the minimum possible stake is just 1p and that is achieved with one active payline, a bet level of one coin per line and a coin value of 1p. The maximum stake meanwhile,e equals £100 and occurs when all 20 paylines are active, a bet level of ten coins per line is chosen and the top coin value of 50p is selected. 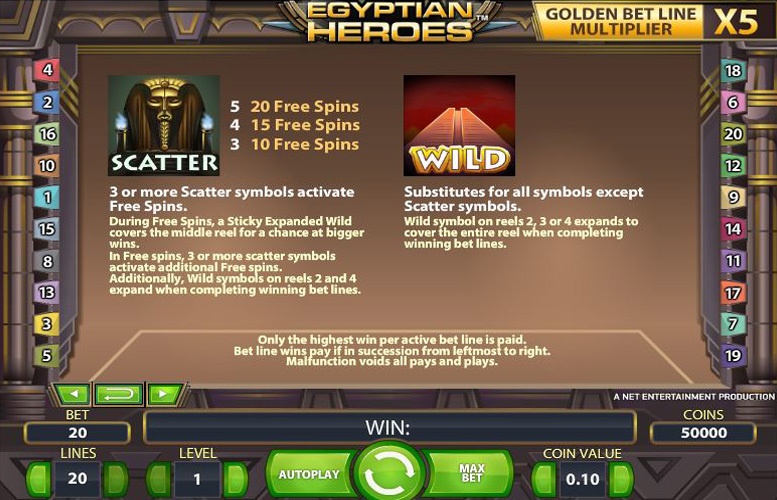 Egyptian Heroes is a slot game that will appeal to you if you are looking for a relatively simple slot, with a decent top jackpot and offering outstanding control over how much you stake. The game’s Ancient Egypt theme is one which will surely appeal to many but it is perhaps not utilised as much as it could be in providing bonus features. The slot does have free spins and Expanding Wilds to add a little extra interest to gameplay, and a Golden Bet Line which can provide an extra multiplier to winnings, but besides these has few special features. What the game does have however, is an almost unparalleled level of choice when it comes to a player’s stake amount. Allowing players to choose the number of paylines, the bet level and the coin value for each spin makes it really easy to keep a handle on what is being spent, and that is a real plus. This game has a rating of 3 / 5 with 123 total reviews by the users.